Japanese and American chestnut burs are both covered in a dense mass of spines; the Japanese variety is distinguishable by the way their spines interlock to form a thatched pattern. Within the bur are 3 large inner nuts which measure between 1 and 2 inches in diameter. The nut of the Japanese chestnut has a meaty texture and offers a starchy, nutty flavor which when fresh is often bitter. Japanese chestnuts come into season in the early winter and when dried are available year-round. The Japanese chestnut is known botanically as Castanea crenata and is a member of the Fagaceae or Beech family. Japanese chestnuts are known for their resistance to common chestnut tree diseases such as blight fungus that plague American and European cultivars. The flavor of Japanese chestnuts, however, is not as desirable as that of the American and European cultivars; as a result, many modern plant breeding programs are putting effort into combining the Japanese chestnut with American and European varieties in an effort to breed superior chestnut cultivars. Chestnuts have a nutritional content more so akin with grains than nuts. They are approximately a 50/50 split of water and carbohydrates and additionally offer a small amount of high-quality protein and oil. The flavor of the Japanese chestnut can be somewhat bitter, so the nuts are most often used in cooked applications. Japanese chestnuts can be steamed, roasted, boiled, candied or dried and ground down to make flour. Their high carbohydrate content makes them an ideal starch substitute for potato. In Japan, the chestnut is used to prepare many regional specialties such as kurigoan (steamed rice and chestnuts) and kurimanju (chestnut ravioli). On New Year’s the chestnut is also popularly served candied with sweet potatoes (satsumaimo) in a dish called kurikinton which translates to mean “chestnut gold mash” and is supposed to ensure good luck and prosperity in the New Year. Japanese chestnuts are also popularly used to make an array of different desert applications such as cakes, candies, and other confections. Fresh chestnuts should be kept wrapped in the packaging they came in or sealed in a plastic bag to prevent moisture loss and stored in the refrigerator. In the United States chestnut blight fungus was introduced in 1904 via imported Japanese chestnut trees. Within 4 decades blight had spread across the country infecting nearly every tree on the continent. The introduction of blight so devastated the America chestnut tree population that in 1950 the American chestnut was deemed a threatened species, a status from which it still has not yet recovered. Since Japanese and Chinese chestnut trees are resistant to blight efforts have been made in recent years to breed the blight resistant species with American and European cultivars in an effort to produce blight resistant chestnuts and save the American chestnut from extinction. Japanese chestnuts are native to Japan and the Korean peninsula where they have been cultivated since the 11th century. The chestnut is one of the most ancient fruits of Japan, and its cultivation predates even that of rice with the nuts providing a year-round source of food for both people and animals there. Today in Japan chestnuts are still a highly important foodstuff in the Japanese diet. 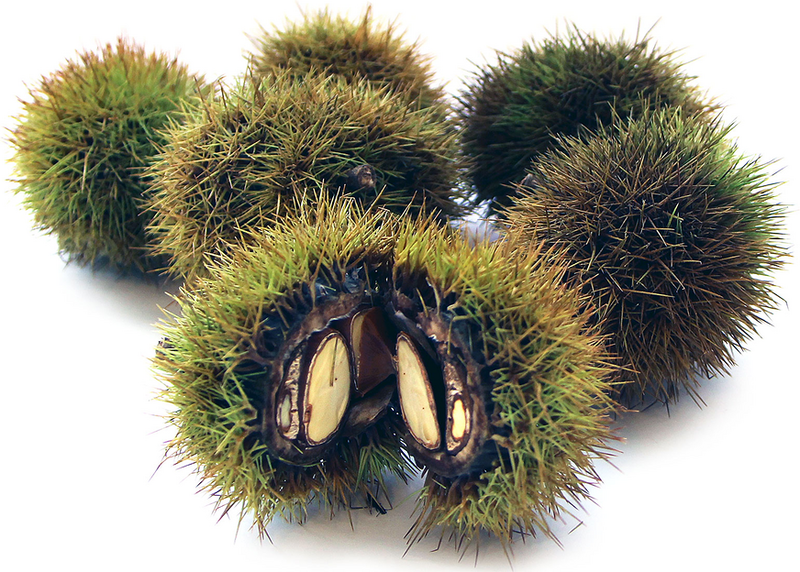 The majority of the domestic Japanese chestnut supply is used fresh during the winter months. Japan is also the largest importer of chestnuts with the bulk of supply coming from China. Today Japanese chestnuts can be found growing in Europe, China, New Zealand, and the United States. Additionally, the trees are extensively used in modern chestnut tree breeding programs in the United States. Recipes that include Japanese Chestnuts. One is easiest, three is harder.